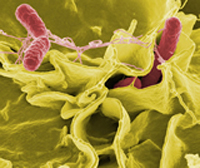 Cleaning products for use in commercial, agricultural and domestic settings could be contributing to a rise in bacterial resistance in food borne pathogens including Salmonella, BBSRC-funded scientists at Birmingham University have found. They recommend a decrease in the "frivolous" use of biocides, particularly in domestic products to ensure the number of resistant bacterial strains does not increase. Improving the control of bacteria that cause food poisoning reduces losses and wastage throughout the food production pipeline thus helping to ensure future food security. Biocides are chemicals which kill pathogenic (disease-causing) bacteria and are therefore commonly used in hospitals, farms, food processing outlets and increasingly the home, to eradicate bacteria and prevent sources of possible infection. Increased use of biocides in domestic products has lead to accumulation and persistence of some biocides in the environment. It is this persistence which is of interest to Dr Mark Webber and his team. "The use of biocides in many settings is crucial but the increasing accumulation of biocides in the environment can lead to bacteria being repeatedly exposed to them in low concentrations. We have found in the laboratory that this exposure results in bacteria which adapt and become more tolerant to biocides but are also in some cases cross-resistant to antibiotics used for treatment of infection" said Dr Webber. While many uses of biocides are essential, some could be described as frivolous. Biocide use should be restricted to where there is a clear need or benefit in order to lessen the likelihood of biocide and antibiotic resistance emerging. There are already a number of pathogenic bacteria which cannot be killed using conventional antibiotic treatment. Alternative treatment regimes are being investigated, but it is recommended that measures, such as limiting unnecessary use of biocides, are taken to ensure the number of antibiotic resistant strains remains low.